It started while I was thrifting, when Isobel tagged along beside me, grabbing things out of bins or trying on hats when she thought I wasn’t looking. Or maybe it really started before that, when she sad on the ground as a baby, digging through my measuring cups and playing with spoons. 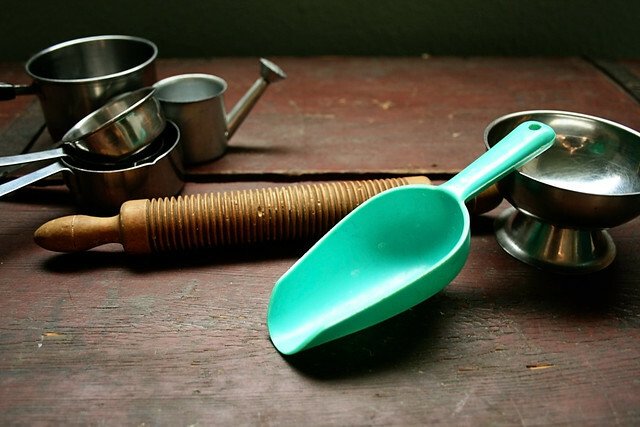 Then, it occurred to me: I could start building her a collection of thrifted kitchen items to play with. Her own mini thrifted kitchen. You can probably tell my favorite area of the thrift store is the kitchen paraphernalia. I’ve talked about it a couple of times. (And I have more planned for the future.) It’s just that vintage kitchens are so charming and so interesting and generally very well-made. It was only natural, then, especially since I have Isobel along with me when I shop, to start buying toys for her in this aisle. Children’s kitchen toys aren’t expensive. In fact you can come by them very, very cheaply. 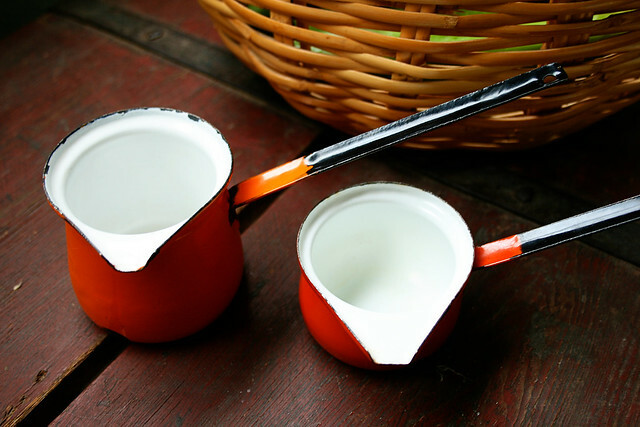 In many cases there is nothing wrong with a regular ol’ pot and pan set, and you can even find some really cute ones without looking very far. Why then, go to the effort of building a thrifted kitchen? Simple: It’s more fun. 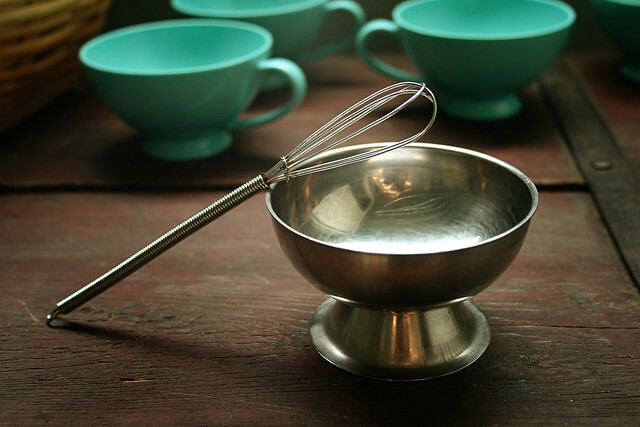 You can build a whole cooking set based just on things you find secondhand. The best play knives I’ve seen were actually (totally blunt, completely dull) cheese knives in the bin at my favorite religious charity shop. 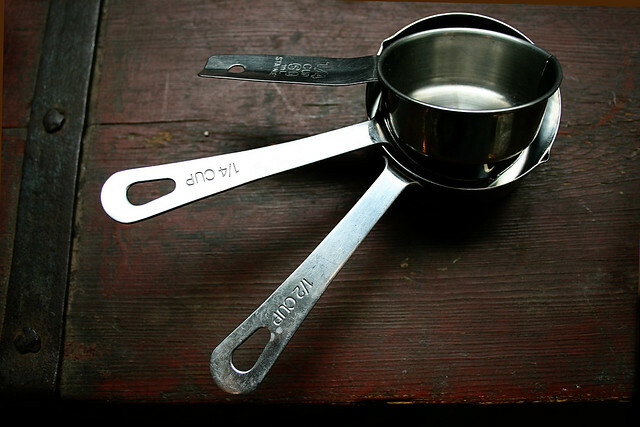 I could find a dozen small saucepans and mini loaf pans in under and hour if I wanted to. 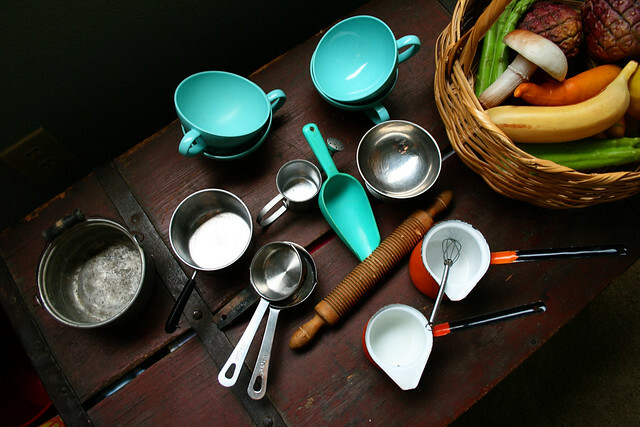 Spoons, ladles, all manner of spatulas can be found for a few cents and make wonderful accessories to a child’s play kitchen. The first thing I bought for the thrifted play kitchen was plastic fruit and vegetables. These are better than all the plastic food versions I’ve seen for kids, and it was less than a dollar for all this and more (Isobel was playing with some of the fruit at the time). The best part about this display food is that it’s healthier than most of the fake food items you can buy. 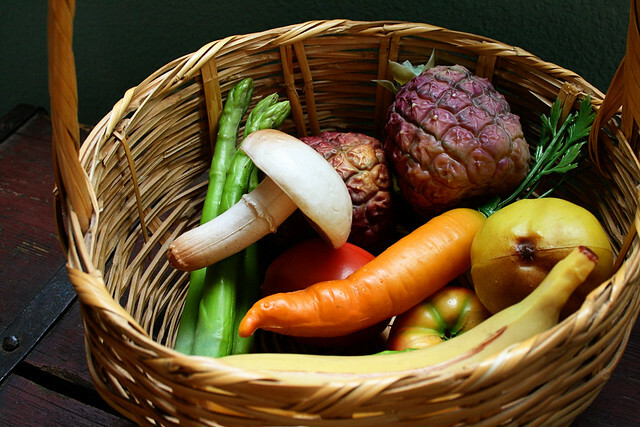 I bought a bag of children’s play food for a dollar at a yard sale before Isobel was born. The healthiest thing in it was frozen carrots. It seems like I can find some healthier versions now that don’t include only canned or boxed vegetables, but I’ve yet to see a set than includes the variety and detail that this set has. Sure, it might be out there. But I found this (in an attractive display basket) for fifty cents. This mitt is perfect for a four or a five year old. I’m not exactly sure what these were used for, but their long handles suggest they are for open fire cooking, maybe part of a camping set. I really don’t know but I adore their orange color. I bought these at an estate sale wherein I had a very embarrassing moment. I walked in the door and immediatley I could see three paths to take: the living room, the family room, or the kitchen. Obviously, I chose the kitchen area and became fascinated by an antique kettle. I rushed forward for a closer look (sensing others in the kitchen who might also want it) before realizing it was full of hot coffee and the ladies in the kitchen were running the sale. Which was all piled in the living and family rooms. 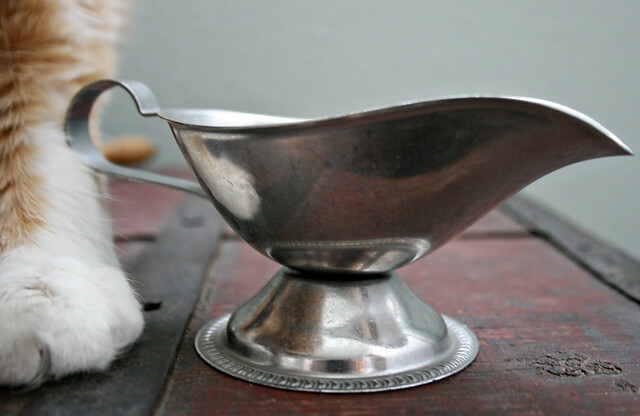 This thrifted gravy boat is perfect for Isobel’s kitchen. It’s to tiny, yet perfectly proportioned like a real gravy boat. Zorro must have known I’d want to take a photo of it next to something else for scale, so he obliged. I found this miniscule whisk and this small ice cream cup on the same trip, and Isobel loves to play with them together as if she thinks they are part of a set. Usually when I’m cooking she’s on a step stool right next to me and sometimes she’ll be stirring her little bowl with this whisk while I cook. The pot in the background was my great aunts and it was hers as a child. It’s circa 1900 and has held up remarkably well. The miniature pan next to it came from my Nana and is surprisingly not a toy. It was part of her Revereware cookware set. 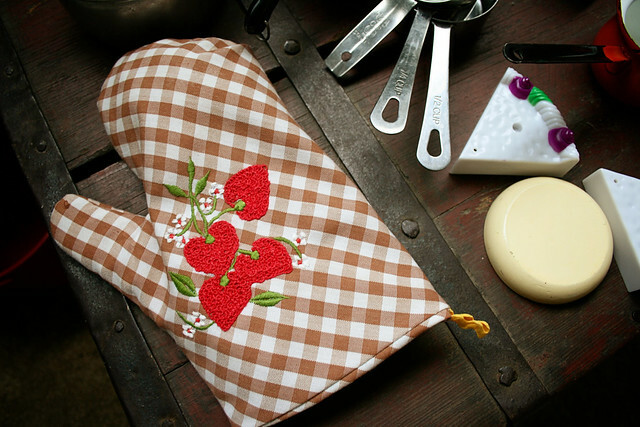 It’s the perfect size for melting butter or heating up a bit of leftover sauce or chocolate in the days before microwaves. 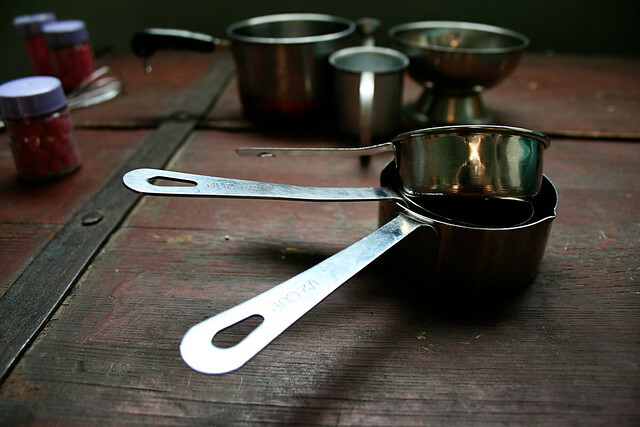 Little saucepans like this used to be common. 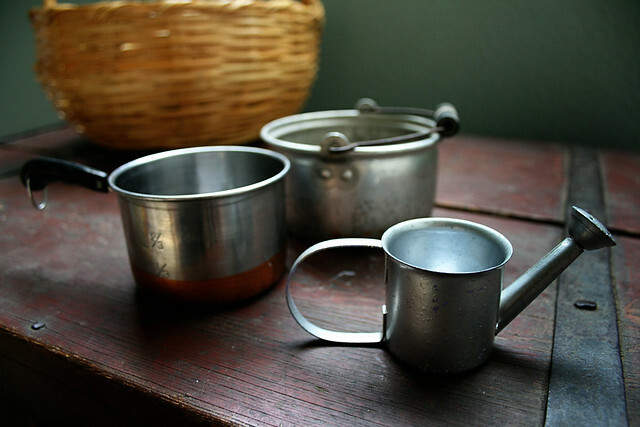 The watering can is usually kept with the kitchen stuff. It just is. I pulled it off a wreath for a nickle and Isobel likes to “water” indoor things with it. The tiny rolling pin came from the same estate sale where I totally embarrassed myself and the tea scoop is a measuring cup for flour. 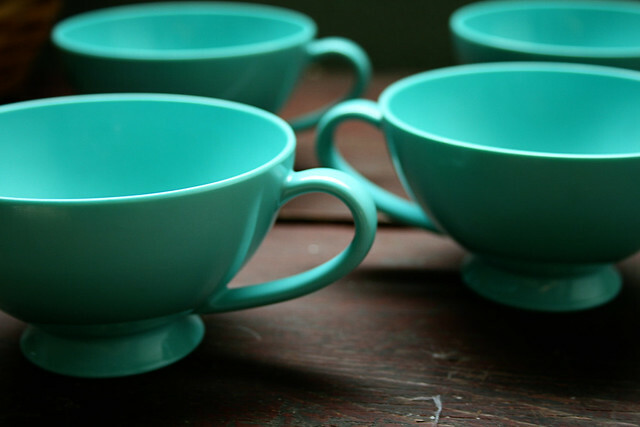 I talked a bit about the blue tea cups here. Collecting all these things only serves a purpose if your kid likes them enough to play with them. Which, fortunately, mine does. 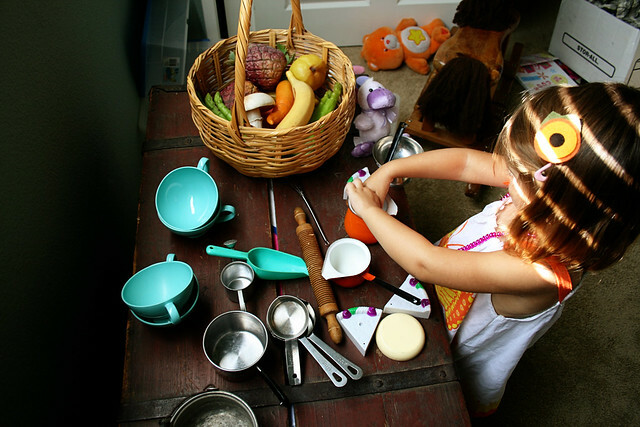 They are some of her favorite toys and the first thing she reaches for when she wants to play, “cook.” I’m always thrifting and on the lookout for more items to add to her collection. In terms of price and charm, secondhand is definitely the way to go. I too am drawn to the ‘kitchen’ section of op shops, I love checking out all the little nic nacs. I think op shops have great things for children to play with; cheap, different & sometimes better than brand new things from the toy shop! 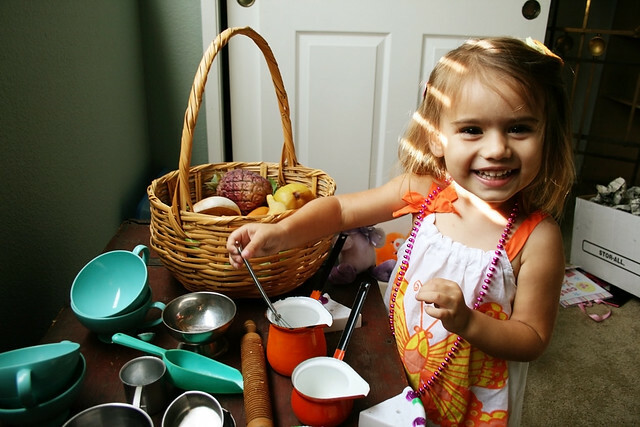 I love your photos in this post & love the items you chose for your daughter. Thank you! They really are the best place for interesting toys, intentional or not. Are they called “op shops” where you live because they are short for “opportunity shops?” I really hope so, because that is exactly what they are. Shops of opportunity and potential. This is so stinkin’ cute and fun! We have had a blast with these toys. What great finds! I love the littler orange…sauciers!? I found a navy blue one the other day. I’d love a whole cookware set with those colors. Enjoy your blog! 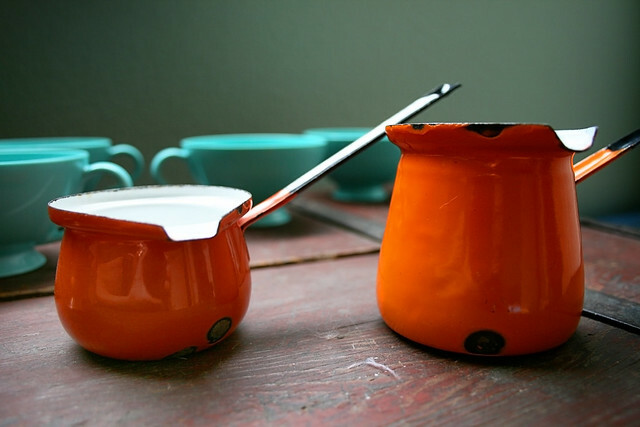 Back in the ’70s we had a red pan like just like your little orange one – my mom used it for melting butter! A fantastic use for it! I hope you take a video of that someday. Not for public internet shaming, but just for posterity. Keep thrifting and it will be!